Commercial and home remodeling insurance can vary as widely as the projects it covers. So, it’s natural that some of the finer details to seem complicated. What is the difference between renovation and restoration? Can you provide coverage on the existing structure being remodeled? Can the owner perform the construction work? 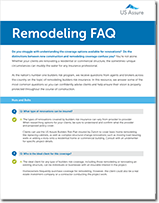 Complete the form to download our free resource and get help securing your client’s next commercial or home remodeling construction project.